Popped in on a Saturday night for a couple of pints with a pal. It was packed with several groups so getting served took a short while due to indecisive punters and one or two bar staff not knowing who was next. Being a Young’s pub all 4 ales were from their stable, there’s also a decent selection of London craft beers in cans and bottles. 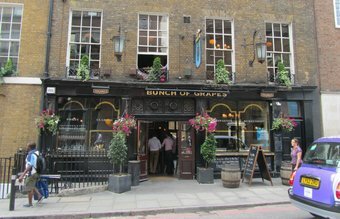 I stayed on the cask ales and had 2 pints of London Gold that were both very drinkable. Nice pub, busy, not overly cheap but it is in a large tourist area. 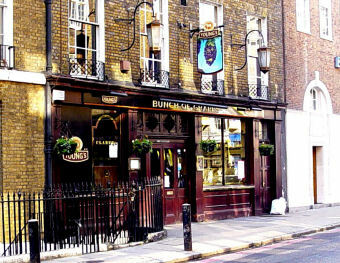 More than serves a purpose and is one of the better Young’s pubs in Central London. A new pub for me despite several visits to this area over the years. Fairly basic looking place, the most memorable & colourful aspect of the pub was the bar lady's tattoos. I have a few mid life crisis cartoons about my body but hers were wide screen Technicolour. My pint of Doom Bar was satisfactory, though @ 4.30 was by far the most expensive pint of the six I had south of the river. A re-visit here for a quick pint on a Tuesday evening while waiting for a train. It’s just after 5pm when I arrive and its already pretty busy, mainly with local workers. 3 Young's ales, plus Doom Bar on tap. My choice of Young’s London Gold was decent enough. Music playing, decent crowd and beers are alright, worthy of a stop. I arrived into LB early for a few beers with a pal in the LB / Borough area so decided to visit the Bunch of Grapes, a pub that I'm not sure I've ever been in before, which is mighty strange for this area. 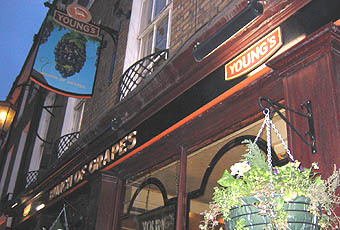 A Young's House with 3 of their ales on cask London Gold, Special and Bitter. The 4th offering was Star from Portabello. I went for a pint of London Gold & it was very drinkable. Attentive bar staff and worth noting that at 4.30pm on a Saturday there were lots of staff in the pub, better than being under staffed! Stripped wood flooring thorough out with little tucked away area’s with glass partitions. Garden to the rear was very popular. There’s a dining room upstairs but I didn't venture up. Food available downstairs also and it looked good, but seemed a little pricey but it is a good catchment area for tourists and visitors. The BoG is a nice pub serving Youngs ales, but it's nothing special. I got chatting to a few American tourists who were keen to tell me just how much they love a traditional old English boozer. They can do better than this; there are so many interesting pubs in this part of London. This is a one pint pub - drink it, enjoy it but don't hang around, move on. That said, landmark enthusiasts will be pleased to know it's near London Bridge station, Southwark Cathedral, and the Shard. Woohoo.